Welcome to my blog! I’m Jessica and I am a huge enthusiast for calligraphy, bullet journaling, lettering, and creative endeavors in general. I started this blog in 2015 as a way to share some of my journey as I learn and grow in these realms, and using these mediums as a way to cultivate an intentional and beautiful life. If you’re looking for inspiration or guidance on how the bullet journal system can help you create a purposeful (or at least less stressful!) life, inspiration and tutorials for learning hand lettering, or ways you can engage with a community of these awesome #bulletjournaljunkies and #planneraddicts, you are in the right place! Since I was in elementary school I’ve been a planner girl. Since then I’ve tried so many different systems, from free school planners, to the binders, countless post-its, to digital apps, and so many others with fleeting success. 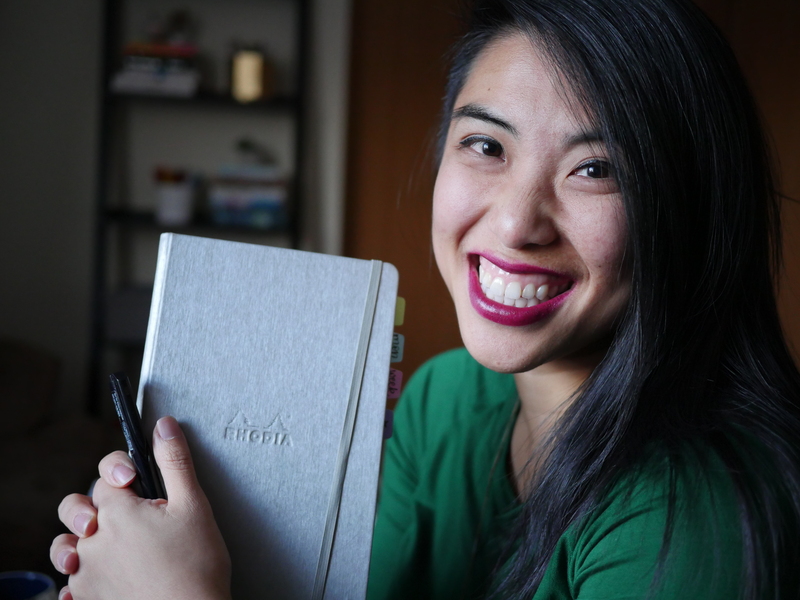 Today, I am settled in with the Traveler’s Notebook and bullet journal system, which I’ve spent months refining the system and making it work for me, so I will share my thoughts and process with you so you can do the same! Simultaneously, I grew up for an interest in letter-forms, and my mother taught me basic Italic calligraphy when I was a kid. Last year I said to my husband, “You know… I don’t feel like I have any hobbies!” – and thus my rebirth in the lettering community. I’ve been playing and practicing ever since, and it has given me new energy I never could have predicted as I’ve experimented with new mediums, styles, and finding my own style. … that I work full time at a university and teach college students – it is a vocation I love, and where there are plenty of projects to keep track of. My planning revolves around my work and my household – so this influences my style and my system. Without a family to take care of, my rhythm and schedule might look much different from yours. …that there may be affiliate links on my blog – simply put, if you happen to purchase something through them I make a small commission at NO additional cost to you. The proceeds help support the work I do here – so I thank you for your support! Sometimes, I don’t put myself out there in these public ways because I, like many others, believe everyone else is more interesting, more capable, more equipped, more competent… but why not me? So here I am. Perhaps something I share will be helpful to you, and it will be worth it. Looking for a place to start? Check out my posts on Beginning Handlettering or my latest planner set up. Check it out, share, and subscribe. Hope you enjoy! I really, really want to get my BuJo set up but Ryder’s explanation is so confusing!! What on earth is a signifier? I don’t understand about collections. Very frustrating to have a high IQ but I am so overwhelmed. I’m currently using a Moleskine 5×8 journal and it just isn’t working for me so I think this system will really be helpful. I like your setups but I just can’t wrap my mind around that I can do to get my own system. You are very clear, honestly, but I have made the mistake of looking at several people’s YouTube videos, which probably part of the problem. Hey! I totally understand the overwhelm, honestly. I did a full breakdown in a video on my own YouTube channel called Starting a Bullet Journal… Maybe it will help! I just wanted to thank you for the You Tube Video you did on watercolor journaling. I am a bit behind on my remarks, but thankful that you keep things accessible for awhile ! Regarding current life stresses related to politics and the like, I am 60 and this too shall pass. There is a saying that “The more things change, the more things remain the same.” Sounds counterintuitive right ? But then there is the saying “There is nothing new under the sun.” And “For everything there is a season… ” All of this is to say that helping people live better lives and be more intentional will bring about the changes you seek. Another quote… “Be the change.” We all have our parts to play. And a final quote… “The pen is mightier than the sword.” (Which may be Shakespeare I believe).